The Yogen Früz Pinkberry Brain Project is an outdoor exhibition featuring sculptures from artists and thought-leaders from across North America. The goal of this project is raising awareness and funds in support of brain health research at Baycrest Centre, a global leader in brain health and aging. The 2018 exhibit is up and running at Yorkdale Shopping Centre and free for all to enjoy! You can find the brains by visiting The Brain Project’s website. As the title sponsor for The Brain Project, Yogen Früz has sponsored the brain piece “Open 24 HRS” designed and created by Canadian fashion bloggers and sisters, Cailli & Sam Beckerman! 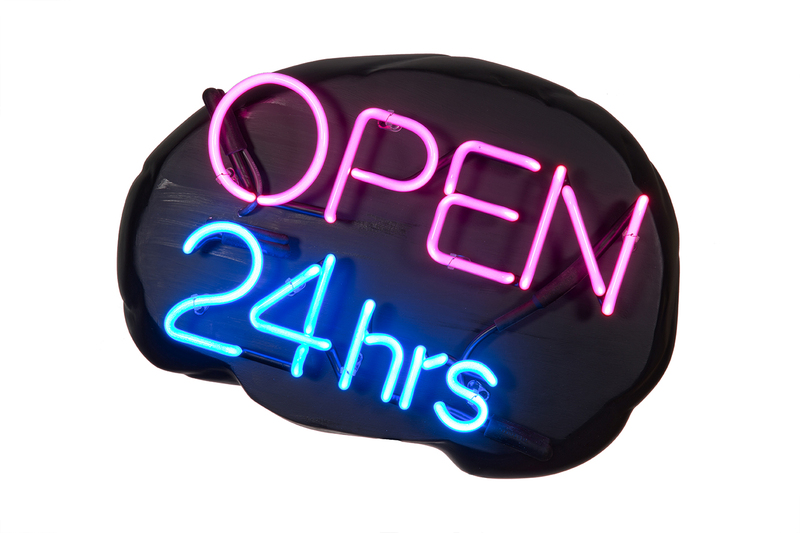 Open 24 hours originally came from the idea of a convenience store OPEN sign. The notion that our brains are open 24 hours, 7 days a week, just like a 7-Eleven store. It’s important for us to live life with openness and compassion, fearlessly and vivaciously. The concept is that our brain is always working non-stop and running 24/7. We must take care of it, ourselves and each other and find a cure for Alzheimer’s. The artists picked the colour pink for the OPEN neon sign because it represents love and all things sweet and happy like bubblegum. The “24hrs” colour blue represents an endless summer sky, the blue sea and makes them feel grounded. Cailli and Sam’s grandmother has Alzheimer’s and it is important for the sisters to be part of this project to help raise awareness. Memories are an integral part of the soul and living life with an OPEN mind and spirit is crucial to cherishing those special moments 24/7. You can also visit the Brain Project website to see all the brains and make a donation online!